Furniture Hunting at Macy | Teefa Says..
As you probably know, my earn-with-blood-and-sweat house is almost ready (who am i kidding? My closest friends ears are practically bleeding hearing babbling about this house!). All left to do is waiting for key-giving letter to come and i officially have my own house. Yayy! So yesterday i decided to go furniture hunting. i dragged Mr. Chenta to Macy (poor him). i'd like to humbly share my findings..
L-shape sofa: i've always liked L-shape sofa. i think it's space-saving, chic and practical for a condo like mine. Price range for L-shape sofa at Macy is around RM3000 to RM6500. Of course the price depends on size, material, and design of the sofa. They come with 5-year warranty. 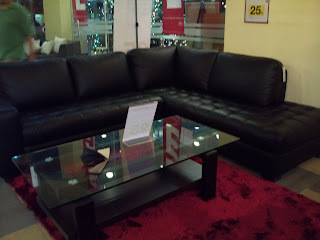 A full-leather L-shape sofa costs around RM3500 (after discount) and a fabric L-shape sofa costs about RM2200 after discount. Sofa sets: Macy has a wide range of 3+2+1 sofa sets. The price range from RM3000 to RM6500 depending on size, material, and design of the sofa. i found my ultimate sofa goddess. It's a 3-seater chesterfield purple velvet sofa. i've seen it in Impiana magazine before but seeing it face to face took my breath away. The price? RM6500. i like Macy's sofa and couch collection. They offer a wide variety of fabrics and colors, come with 5-year warranty and they're very comfortable. Macy's bedframes are nothing to shout about. You can get the same designs from ordinary furniture outlets. What differentiate Macy's bedframes and the others are the quality. Each bedframes come with 5-year warranty. The materials used are of oak (or other hard woods.. i'm not sure). You can see the difference in their workmanship. Tak payah risau katil patah :p The price range is around RM2200 up to RM4500. As for mattresses, i only saw King Coil mattresses with price range of RM1500 to RM4500. They sell dining tables and chairs separately. The price range for dining table is around RM2000 up to RM5000 while dining chairs cost about RM180 to RM400 each. (Yes..each..sebijik oke..). As they're having Year End Sale right now, i'm lucky enough to grab a 7-piece dining table+chairs. 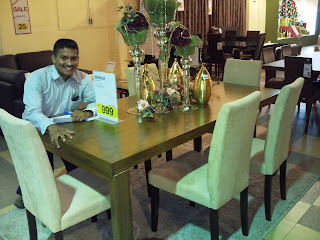 The Munich dining set costs RM2499 but for the Year End Sale, they sell it for RM999! i wasted no time and purchased one. Ahhhhh...my very first dining table set! The only downside is that they only come in one color (creamish color instead of black that i've always wanted). But what the heck? The newly purchased Munich dining table. Quite a steal huh? Of course it excludes the Christmas ornaments and the male "model". They have lots of fabrics and designs to choose from and i really like their chic designs! They sell at about RM10/m to RM45/m. They even have curtain-making service. For the time being, Macy is having a promotion. For a 3-bedroom house, you only have to pay RM499. But of course T&C applies. What do you do on a girls day out?